Stream your songs or download them so your family can sing and play along even when you don’t have Internet access. Show or hide on-screen lyrics. Turn the vocals up or down—or off completely for an instrumental track to make up your own words. Use your device’s camera to record to the music and easily share with friends. 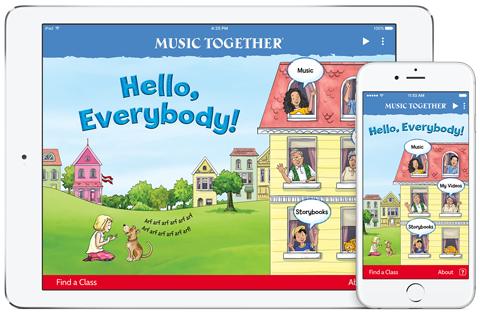 Flip through the colorful pages of Music Together’s award-winning Singalong Storybook Hello, Everybody! Download the Music Together "Hello, Everybody" app from the App Store or Google Play today!